I’m a writer and an editor who works in the Baltimore-Washington area. I hold a bachelor’s degree in journalism from the University of Maryland and have studied at Georgetown University. I write on a range of topics: history, public policy, film, books, music … and the work of Rod Serling. My work has appeared in a variety of newspapers, magazines and websites, including The Washington Post, The New York Times, The Wall Street Journal, and USA Today. But when I’m not doing work that brings a paycheck, I turn to the fun stuff. Hence this blog. Oh, and my name is Paul. You can reach me at nightgallery (at) rocketmail.com. Hope to see you in some corner of the fifth dimension soon! I ran across your site while searching for Twilight Zone on Twitter. Have you heard about our documentary on Charles Beaumont? http://www.jasunni.com. We may be doing a Serling themed film festival in Seattle next year as well. Thanks, Sunni. I’m glad you found the site. Are you on Twitter? I have heard of the documentary — thanks for the reminder. It sounds great. I’d love to pick up a copy, if it’s available on DVD. And the film festival sounds interesting, too. Wish I lived closer to Seattle, but I’m on the east coast. Hi, Tom! Glad you found your way here. Yes, I’m sure that nostalgia is a big part of the Zone’s continued appeal as we grow older. Of course, the fact that it’s so well-written and acted is a key factor as well! And yes, “A Stop at Willoughby” is great. I did a blog post on that one and “Walking Distance” not long ago; it’s called “Trying to Go Home Again.” I’d love to get your thoughts — it’s about the 4th one down on the homepage. Hope you keep coming back! Just found your site. Love TWZ. You should connect with my friend Arlen Schumer, a comic artist and historian, and huge TWZ fan. He written extensively on the subject and might make for a good connection: http://www.arlenschumer.com/twilight-zone. Thanks, John. Glad you found the site How did you happen to find it, by the way? That site you recommended looks interesting — I think I’ll list it in my blogroll. The idea of a coffee-table book dedicated to TZ artwork sounds terrific. Cool site, Paul, and excellent banner work, Marcia! Thanks, Frank! I’m a fan of yours as well! Hey — great site! Just found out that Julian Assange is using quote from the Twilight Zone episode “No Time Like the Present” to define Wikileaks: “History is Inviolate”. Would be great if we can get this known. Serling was a genius! Here’s a video from a recent production with the quote repeated over and over. Can we get some action to correct the record and show that this is a Twilight Zone quote? I’m not sure what to say about Julian Assange, but I can tell you that I’m grateful for the praise. Glad you enjoy the blog! Paul, thanks for being you! I have nominated you for the Liebster Blog Award: http://fpdorchak.wordpress.com/2013/02/18/spreading-the-love-a-liebster-blog-award/! Much appreciated, GEG! It’s simple, really: 1) Think deep thoughts about the most well-written TV series of all time. 2) Dress it up with pics from my Gal Friday, the lovely Wendy Brydge. 3) Sit back and count the money. Okay, I made up No. 3 (alas), but the rest is spot-on. Thanks again! I just found your blog from Twitter. I look forward to reading it and plan to start my own Rod Serling blog next month. Thanks for doing it and I can’t wait to read it from blog to blog. Thanks, Philip! Hope you’re enjoying it. One of Rod Serling’s most overlooked works (and one that preoccupies me) is his 1967 book THE SEASON TO BE WARY. Might we see an article devoted to this? As the TZ books were, I believe ghosted, this is Serling’s only published work of original prose. Very true, Dale, and yes, “The Season To Be Wary” certainly is post-worthy. Not only is it unique, it ties in nicely to “Night Gallery,” with two of the three stories subsequently being dramatized for the 1969 NG movie. Thanks for the suggestion. May I suggest you subscribe to the blog? Then you won’t miss it when it appears. Thanks. I will be following your activities. Glad to hear it! Unless you’re a Kanamit. What a great site! It’s about time somebody paid tribute to the TZ like this. (Maybe there are other sites but I don’t know of any.) An ep that is not among the most famous, but is high on my list of favorites, is “Number 12 Looks Just Like You.” It opens with Serling saying something like, “Let’s say it’s the year 2000…” The closing remarks are the really heavy ones, though. Thanks, Bart! You’re right, that’s a great episode. Pairs well with “Eye of the Beholder”. Both of them are potent examinations of the pressure to conform to society’s idea of beauty. Powerful warnings, to be sure. Greetings to you and all Zone devotees. This is a great way to reach out to our beloved community of the most sublime art that ever appeared on American television. hello Paul. Glad I stumbled across this site. 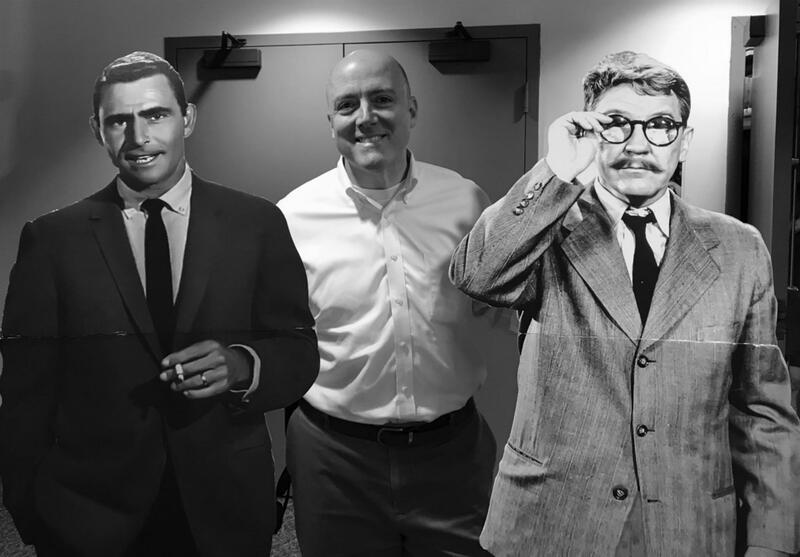 As a fellow DC-based public relations professional who also happens to have a more-than-passing fondness for Twilight Zone and other Rod Serling-esque entertainment, it is refreshing to find intellectual conversation about these classic works. Thanks for keeping the interest alive. My pleasure, Johnny. Glad you’re enjoying the site! I avoid being served, as much as possible! Hi, Paul, :) So excited to have discovered your blog when I was searching for Rod Serling. I’m starting a fiction magazine that’s going to host stories in the classic style of Night Gallery and Twilight Zone. I’d love to talk with you about reprinting some of your blog articles from it. If this interests you at all, please contact me. I think I’ll email you also, just to be sure you see it. Sounds terrific, Angel. I’d be glad to look into contributing! Hi, Julia. Glad you found your way here! And yes, I have a very good lead for you: http://www.rodserlingbooks.com/. It’s only been around for the last couple of years, but they have a number of Serling’s previously out-of-print books available. I found your blog while trying to find an episode of The Twilight Zone. Are you familiar with past episodes? Ages ago I saw part of an episode, but never saw the end. It has bugged me ever since. It is about a young married couple who have to stop in a small town because the wife is having a baby. The next day the husband cannot find his wife and everyone in the town only says a couple of words. He talks to the bartender who seems to have more answers than others. Is this actually a Twilight Zone episode? Hi, Kaci! Glad you found your way here. I’m very familiar with past episodes, yes, and I can tell you this is definitely not a TZ. At least not from the original run, though from what I can tell, this storyline didn’t occur in the second or third TZ series either. There are other anthologies it may well be from, of course. Wish I could tell you which one, but you can at least cross TZ off your list. Hope you’ll return to the blog, though, if you’re a TZ fan. I’m also on Twitter at https://twitter.com/TheNightGallery, and on Facebook at https://www.facebook.com/ofshadowandsubstance. Good luck searching for your show! I think it was a One Step Beyond episode. I don’t believe it was Thriller. Hello Paul, This is a GREAT blog site. Wonderful. I, also, am a great Rod Serling fan. I have the entire series of the original TZ show on DVD. I also have the entire series of the 1980’s TZ series on DVD. You have here a great tribute to Rod Serling! Hi, Richard! Glad to hear you’re such a Serling fan and that you like the blog so much. It’s a pleasure fanning over RS’s amazing work! Hello, everyone! I LOVE this website, I go on it everyday to see if there is something new. I am a die-hard Twilight Zone fan, I’m working on watching all the episodes on Netflix, and I find this website nice, because it’s hard to get a hold of such true and good information about TTZ or Rod. You know how you say “daily dose of Serling” well, I have to get 2 doses — one from one of my TTZ books and this website, so thank you, Paul, for making this, and have a wonderful life. Well, thanks! I’m glad you enjoy the site so much. I wish I was able to post more often — I imagine those daily checks must get frustrating when it’s been a couple weeks, but I appreciate your persistence! You have a wonderful life as well. Hi Paul, I’ve been following your twitter account for a few months now, but it wasn’t until now that I checked up your blog. Nice work! I’m a Twilight Zone fan since I was a kid, it’s simply a show that changes you forever, and although its almost 60 years old, it just keeps on surprising me everytime I rewatch any episode. Just wanted to leave my appreciation and respect for your effort. Big ups! Thanks, CSL! (Sorry, I don’t know your name.) I’m glad you’re enjoying the tweets and that you’ve checked out the blog. I hope you come back regularly. And I appreciate the comment! I follow your page on twitter.. Any chance you could start including the episodes you get the quotes from? Thanks, Rusty! Glad you’re following the page. The only problem is that of room. I have only 140 characters, as you know, and that fills up quickly. I do, however, often include the season and episode number (e.g., #S1E23) so people who are interested can look them up. And as I sometimes remind people, you can always ask me. Hey Paul, just found your site. Love it. I was going through a list of Twilight Zones on Netflix and saw “A Disturbance at Owl Creek Bridge” which my 6th grade English teacher showed us years ago on a projector in class. The movie stuck with me and inspired me to make the films I make today. I was shocked to see it as part of the Twilight Zone collection. I don’t think it was made by Serling (but perhaps acquired for the show?) Was curious if you knew. Anyway — great site. Great knowledge. Now, I need to watch more the Night Galleries. Glad to have you here, Greg! I can certainly understand your confusion about “An Occurrence at Owl Creek Bridge”. It was a French short film (one that won an Oscar, in fact) that was acquired by TZ’s producer as a way to cut costs during the show’s fifth and final season. Took only a few trims to get it to fit, and it worked quite well as a TZ, as Serling notes in his intro to the episode. Hi Paul. I’ve just come across your blog and really love it. Keep up the fantastic work. The Twilight Zone is one of my all time favourite series. I love how the episodes can scare, move and grip all at once, and how even though you know what’s coming if you’ve seen an episode before, the twists are still effective each time. Thanks, Maddy. I appreciate the kind words. You’re so right — even I’m surprised by the depth of these wonderful episodes. They certainly bear rewatching. Glad to have you here! I just found your Twitter page this week and followed, and you have a great blog. Rod Serling was a master writer, and truly understood the human condition to aptly weave sci-fi/fantasy and reality like he did. It’s so hard to pick a favorite episode. But one that touches me is “Number 12 looks just like you.” I thought Collin Wilcox Paxton as Marylin gave a performance worthy of an Emmy. And I’ve always loved “The Masks.” All the episodes pertaining to vanity were off the charts good, especially “Eye of the Beholder.” See, I can go on and on, because I’m ready to talk about the robot ones. I can’t wait to dive into the archives and read your thoughts and facts on the episodes. Glad you found the Twitter page and the blog! Serling has proven to be a great writer to delve into — his themes and his writings are so rich. I’m a big fan of “Number 12” and “The Masks” (though I haven’t covered them here yet, alas — stay tuned! ), but “Eye of the Beholder” is my all-time favorite. Anyway, happy reading! Hi Paul. Not sure if you’ve ever done this in the past or not, but I was just wondering if you had ever considered hosting a Twilight Zone themed blogathon? This would be great fun and could give all the followers a chance to write about the series as a whole, or to review individual episodes. It would be wonderful to read all the different views and interpretation of Serling’s work.